The Voie Sacrée, or the ‘Sacred Way’, was a road running from Bar le Duc, a major railhead behind the front, and the forward battle zone at Verdun. In 1916 it was realised that the defence of Verdun by the French Army rested on its ability to resupply the front with men, ammunition, food and equipment. 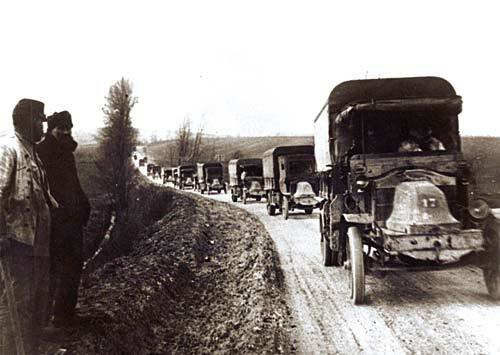 The road ran for 72km and operated night and day with thousands of men and vehicles moving up and down. The memorial dates from as late as 1967 although much earlier a marker stone had been placed every kilometre along the full length of the road from Bar le Duc to Verdun. The site has recently been renovated for the WW1 Centenary with a new parking area and information panels.